35mm glass bottom dish, dish size 35mm, well size 14mm, #1.5 cover glass(0.16mm-0.19mm). Designed for high resolution imaging such as confocal microscopy. D35-14-1.5-N , request a free sample or get a quote. Quote: "First, 100 µg/ml BSA-biotin (Bovine serum albumin labeled by biotin, A8549, Sigma-Aldrich) and 5 µg/ml fibronectin were incubated on a glass-bottom petri dish (D35-14-1.5-N, In Vitro Scientific) for 30 min." Quote: "After 24 hours, cells were split onto Matrigel (Fisher Scientific 356234) coated glass bottom plates (In Vitro Scientific D35-14-1.5-N) and imaged 24 hours later." Quote: "Glass bottom dishes (Cellvis, D35-14-1.5-N) were prepared 109 as follows for all microscopy experiments. 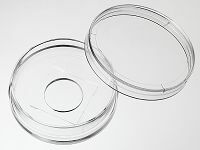 First, dishes were immersed in 1 M HCl at 55°C 110 for at least 4 hours"
Quote: "35-mm glass bottom dishes CellVis D35-14-1.5-N"
Quote: "Glass-bottom dishes covalently modified with fibronectin Glass-bottom dishes (In Vitro Scientific, D35-14-1.5-N) were covalently modified with fibronectin to facilitate subsequent photochemical crosslinking of cells to the dish"
Quote: "Poly-d-lysine coated 35 mm glass-bottom dishes (CellVis #D35–14-1.5-N)"
Quote: "Cells were plated on 35 mm glass bottom dishes with #1.5 cover glass (D35-14–1.5 N, In Vitro Scientific)." Quote: "Glass bottom petridish (D35-14-1.5-N, In Vitro Scientific) was incubated with 1 mg/ml BSA-biotin"
Quote: "Spheroids were then transferred to a 35 mm glass bottom imaging dish (In Vitro Scientific. Cat# D35-14-1.5-N) and embedded within BD Matrigel Basement Membrane Matrix"
View all 13 publications citing "35 mm Glass bottom dish with 14 mm micro-well #1.5 cover glass".